That’s what dozens of participants chanted as they danced in unison outside Long Beach City Hall on March 15. The dance protest was held to honor Women’s History Month and urge Long Beach City Council leaders to draft a strong local wage enforcement policy. 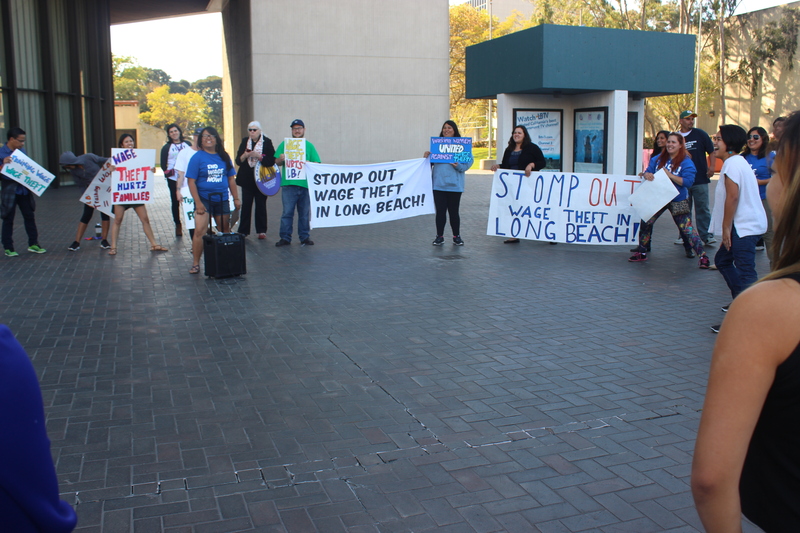 Paula Abad, community organizer for Anakbayan Long Beach, hosted the dance protest which involved various organizations, including the Coalition to End Wage Theft in Long Beach and the Campaign to Raise the Wage. Members of the Warehouse Workers Resource Center also shared how wage theft impacted their families’ livelihood. Black Lives Matter member Dawn Modkins told attendees that truck drivers, restaurant workers, hotel workers, nurses, and CSU faculty are just a few of the groups affected by wage theft. “To have those wages that are already short and slim cut even further by the audacity of employers to steal wages out of workers’ pockets impacts our community that much worse,” said Modkins.